A detailed step-by-step tutorial teaching you How to Build a Huge Chalkboard for affordable! This is perfect for a kids playroom, kitchen, laundry room, mud room or main family room! I am so excited about how this project turned out! I have a plan this school year, but it requires a huge space that I can write and change each week. 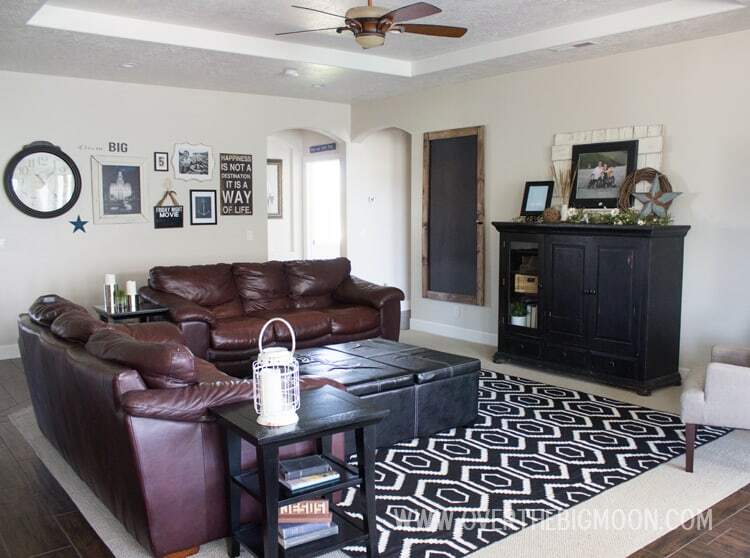 We have a blank space on the wall and I knew a huge chalkboard would be perfect, but I didn’t want it to be an eyesore! The whole project cost me about $60 for everything. 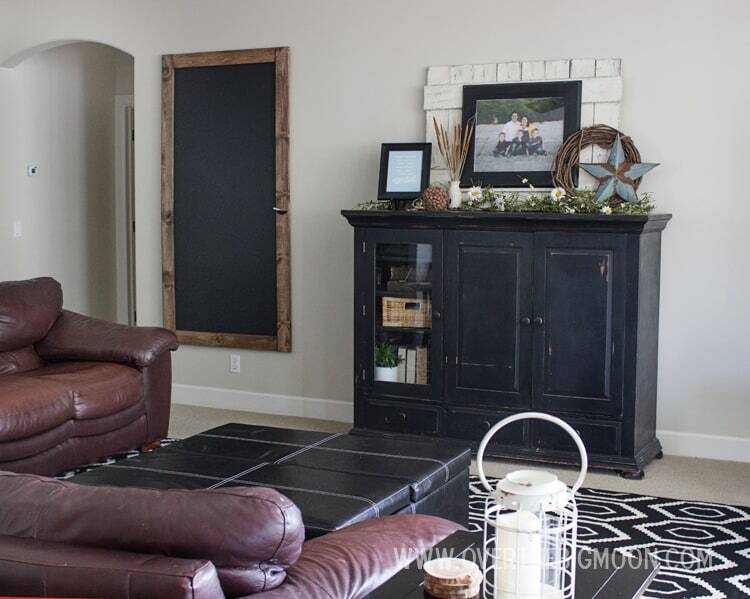 Which for this size of a chalkboard, with a finished stained frame, is a killer deal! The back of the chalkboard is thin MDF from Home Depot. They come in huge sheets, but the wonderful people at Home Depot cut it exactly to 6×4 for me. I suggest having them cut it to the size you specifically want. I brought it home and put a layer of Brush-On Chalkboard Paint and let it dry for 4 hours. Then I aded a second coat. While it was drying, I measured my 1×4’s to frame the MDF. I laid my 1×4 on the side of my MDF and marked them about an inch longer than the MDF. Once I had my 1×4 sides cut I placed them on the MDF. 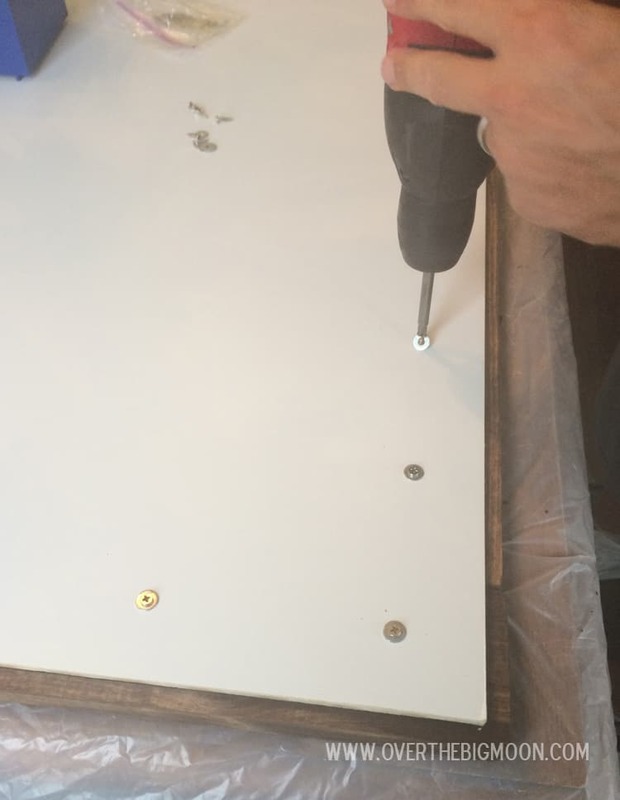 Make sure to place them a little bit over the edge so the wood is more of a frame and the MDF doesn’t line right up with the wood. I started by cutting and placing my two sides. Then I measured the space in between my side board at the top and the bottom of the chalkboard and then cut my top and bottom pieces that length. 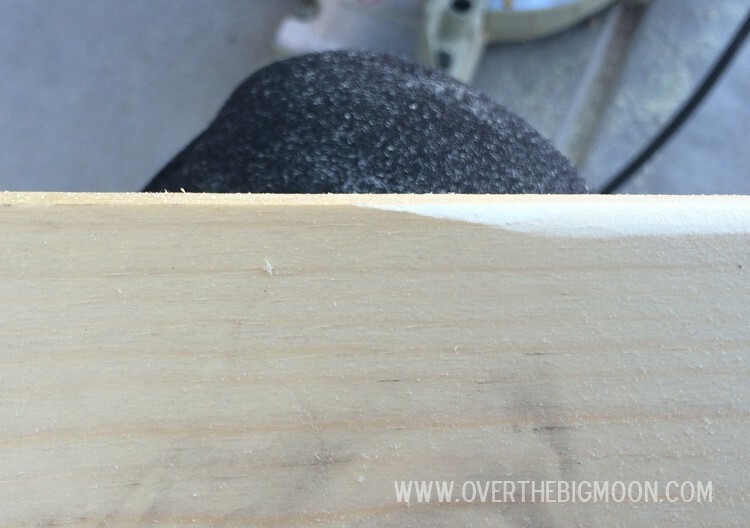 To get a more distressed look on the frame I took our hand sander to the 1×4’s and rounded out the edges. The rounded edge is on the right. I love this look so much more! Once I had the edges rounded I gave the whole 1×4 a good sanding to get it ready for stain. I used my favorite Minwax Special Walnut stain for the frame. It’s warm, but not too red or yellow. We used little screws and reinforced the corners really well, and then added a few screws in the middle. I bought a hardware cup drawer pull to hold my chalk. I suggest buying them at a local hardware store, so you can just buy one and not a pack of them! I just had to screw it in from the back. Just a note for hanging the chalkboard – it is heavy! I made sure we could hang it on the studs in the wall. 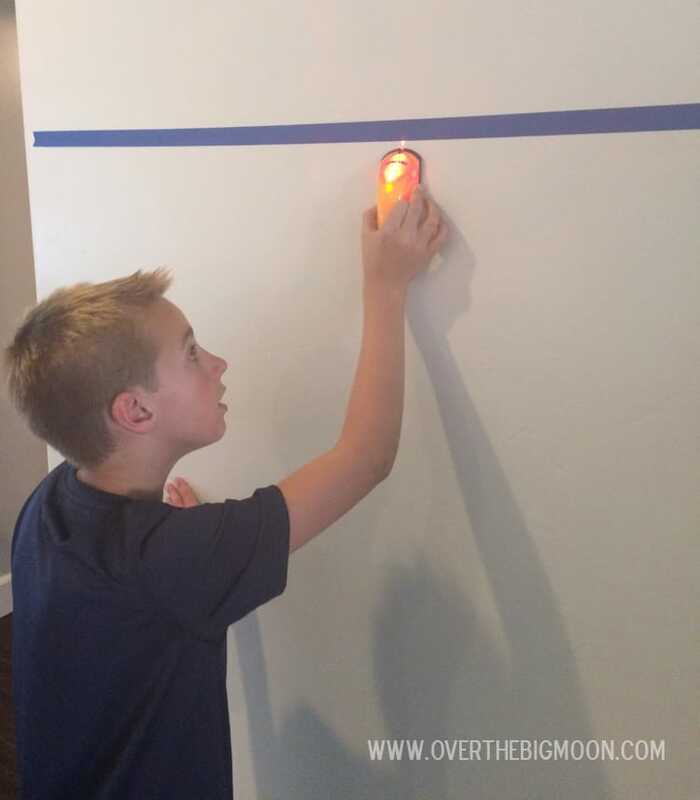 To do this I put a piece of masking tape along the wall. Then I used a stud finder to mark on the tape where the studs were. Once I had the studs marked I took the tape off and put it on the back of the chalkboard. That way I knew exactly where to attached the sawtooth picture hangers. When I nailed the nails into the studs of the wall the sawtooth hangers were the correct distance apart. I couldn’t be happier with how it turned out! If you love this DIY – I’d love it if you pinned the image below! 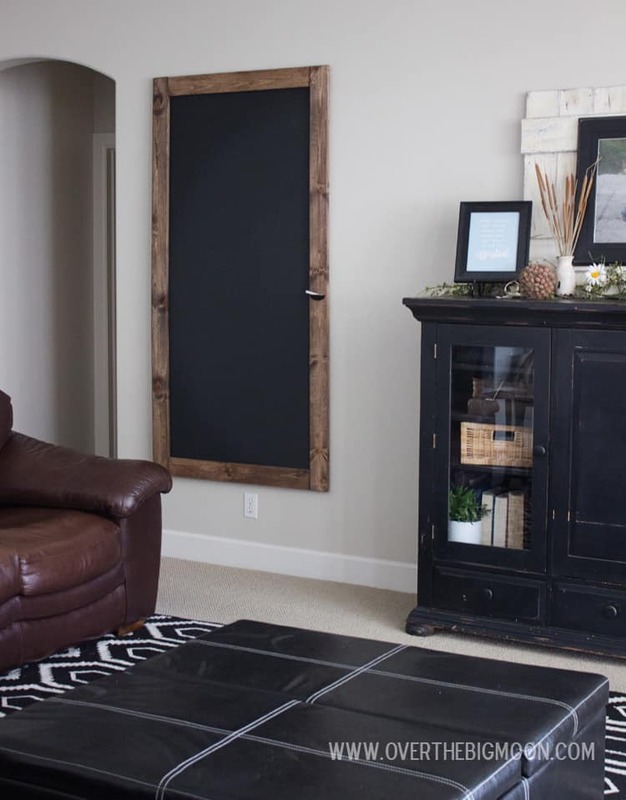 Does this chalkboard with with chalkboard markers? 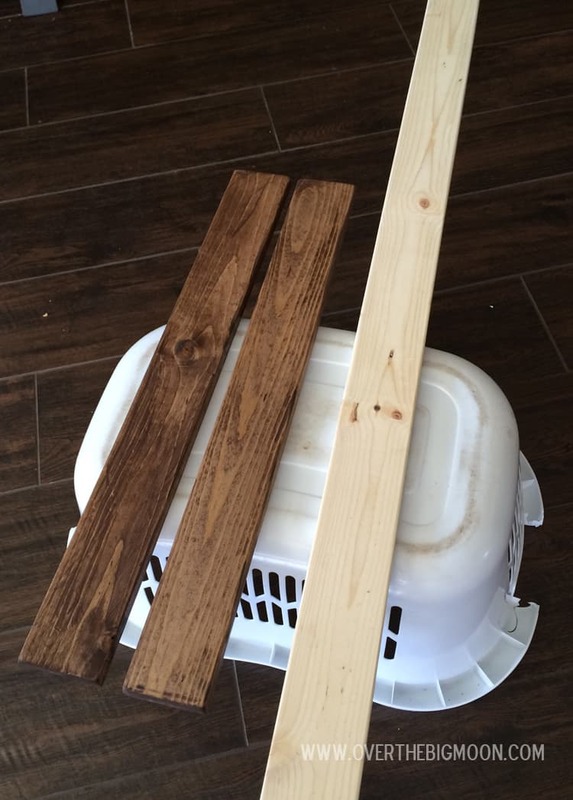 I love this DIY project. I’m thinking of making this to hang in our storefront window. What kind of picture hangers did you use ? I made a chalkboard and am trying to figure out how I can get it completely flush with the wall do that it’s not wobbly when I write. Would love to know! We used sawtooth picture hangers! 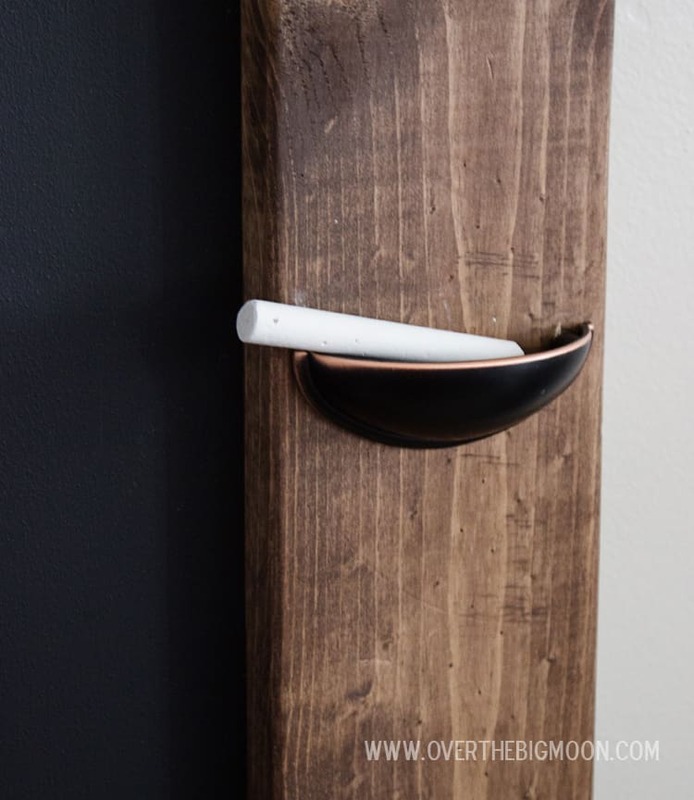 They’re awesome and help it be sturdy and as flush to the wall as possible! I’m so excited I found this tutorial. This is exactly what I’ve been wanting. I have a couple questions as this will be my first project ever! 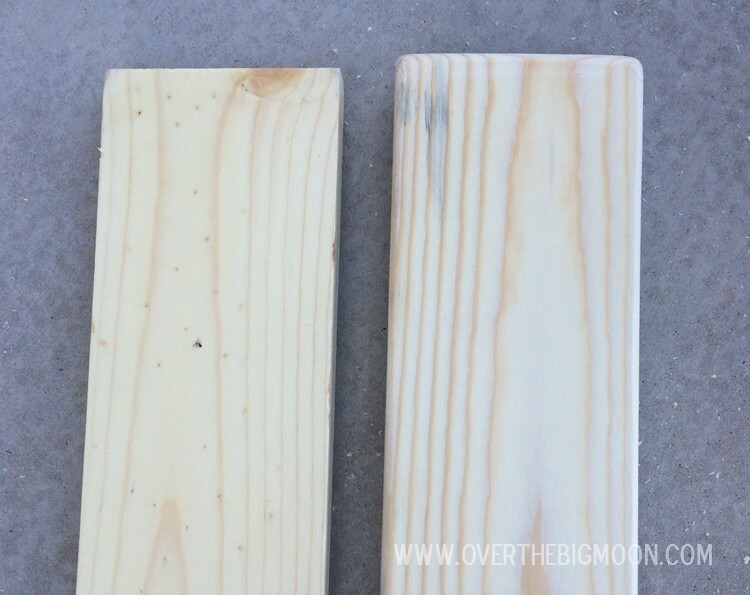 What thickness mdf did you use? The thinnest at home depot is 1/2 inch. Or could I use particle boars which is 3/8 inch? TIA! I believe mine was 1/4″. I would go with something thinner than 1/2″. You don’t want the chalkboard weighing too much! Good luck! Can’t wait to hear how it turned out! 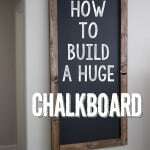 I just found out that home depot actually sells chalkboard already finished. It’s super light weight and one less step. I know this is a little late, but just throwing some extra ideas out there to make it a little easier. I just finished my chalkboard a couple days ago and it looks great! I made a hanger out of stained pine (I used dark walnut) and attached metal flanges and metal conduit to the stained pine to give it more of a rustic look! I just screwed in screw eyes into the top of the chalk board (which I also used stained pine for) and attached it to stainless steel S hooks that hang from the metal conduit. 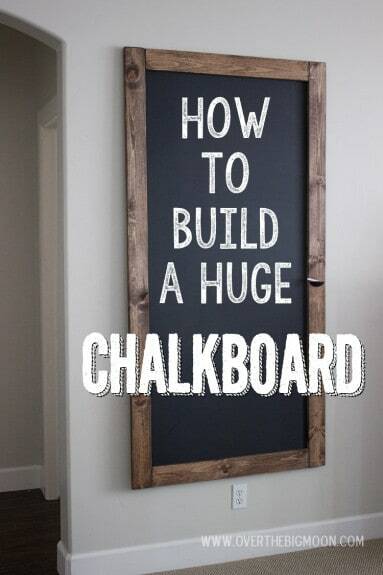 Do you use the chalkboard a lot? How does it hold up to writing and erasing and writing, etc? I chalkboard painted my classroom door and the first time I erased to write something new, you could still see what I wrote the first time and the paint chipped when I was writing on it. I really want to make what you did for my dining room wall but am scared it won’t hold up if I change it often. I have chalkboard painted a few thingsand feel like they’ve done really well. I usually do 2-3 coats and then make sure and cure it good. I agree that it doesn’t erase as easily as a normal chalkboard. But, I usually only change what’s on the board like once a week. Make sure and use a good brand of paint! I am excited to make this before school starts with my family. 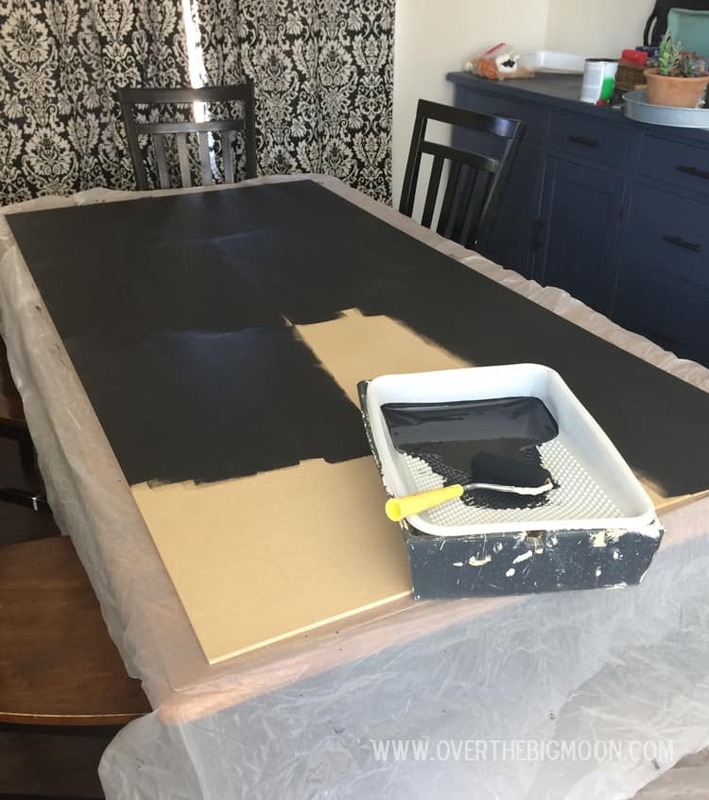 A quick trick about cleaning blackboard paint…. use the Magic eraser with a little soapy water and it that does the trick like Magic! Thanks so much for explaining how it works. I spent hours searching internet to buy one that fits my wall. Very good pin. I did our chalkboard directly on the drywall. It has been the scourge of my existence since the beginning (I started the project 1.5 years ago). I wanted it to be magnetic too for our spelling/reading tiles, so magnetic paint was my first step. That part worked well. Then I painted 2 layers of chalkboard paint, following the instructions on the can. It was rough in places because of the texture of the drywall, even though it isn’t textured. So I purchased a sander and went about sanding the wall (covered with the black paint of the chalkboard). What a mess!! I had black dust everywhere, and probably now have black lung! It didn’t help the texture of the drywall much. I called the company who made the blackboard paint. The rep asked me if I “primed the wall first”. Palm to forehead. “No. It’s been painted multiple times in the past”. She instructed me to prime it, then use only one more layer of chalkboard paint in order to preserve the magnetic paint. 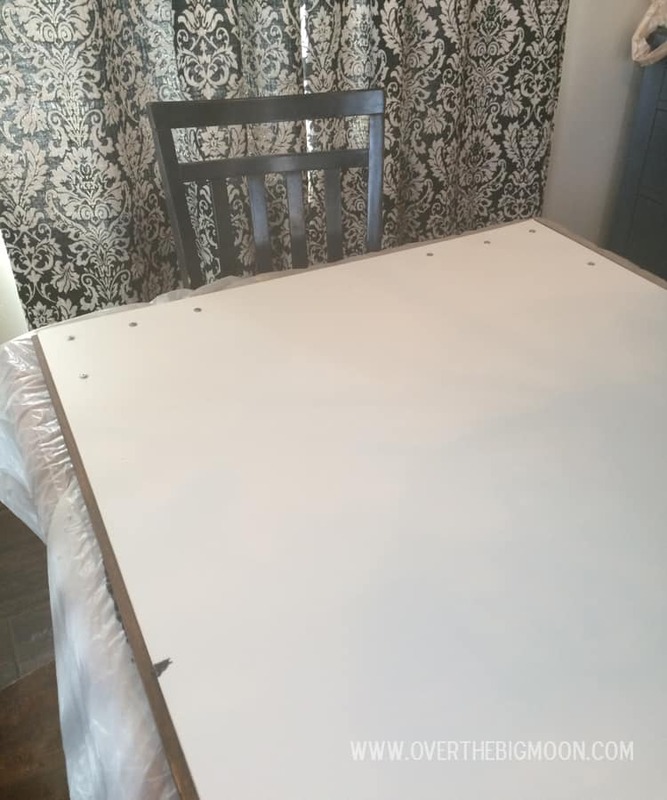 I finally got around to doing this (months later), and it didn’t work…I just ordered a large 8X4 whiteboard. I’m over having to have a blackboard. I must admit I’m hard on my blackboard – it gets repeated daily use. Another problem is that the board doesn’t like to let go of the chalk. I’m constantly needing to wash the board with a damp cloth. Oh well, perhaps the MDF would work better…but I will never know. How do you hang this flush to the wall? We have ours finished and it’s a 4’x4′ and it’s a bit heavy and we were wondering how to hang it flush so the metal chalk board doesn’t wobble. Did you put a sealant on the stained border? I believe I used a polycrylic! Bonnie, I’m just guessing, but most walls have a slight texture, and you get a much smoother surface, and you can gouge into the drywall if you’re not cafeful! I love your chalkboard! I just spent Sunday with my dad making 3 of my own. Thank you!! !